Source Gin is named after the source of the purest water, which is located in the town of Jean Sac La Pallu (our production is located here) in the heart of the Grand Champagne subregion. The purest water, strict selection of o-de-vie from French wheat and natural high-quality extracts, make it possible to achieve the taste of sweetness and unique freshness of juniper with the finest notes of spices. Then, our master of blending, thanks to his unique knowledge, cuts down the strength of alcohol in 2 stages, and then, within 10 days, stabilizes the drink to obtain a roundness and long-lasting stability of the aromas. 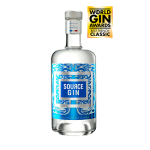 Source Gin has a 43% strength, which provides long-lasting aromatic expression.